Hand knit cozy set poncho & loom knit beret hat. Red orange sweater. 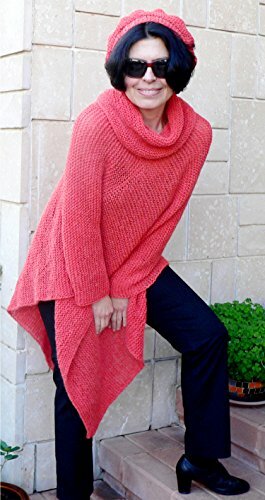 Long and big cowl neck. Loose neckline. Perfect for wearing over a jumpsuit, sleeveless long skirt, jeans, leggings! Very soft material which feels good and not scratchy! Wear it with all types of clothing, evening and day! 45% Alpaca + 25% Wool + 30% Acrylic yarn. Dimension: From shoulder to lower end - 25.5" (65cm); From v-shape to lowest point - 41.5" (105cm). Ready to ship. For difference size or color, please contact me. Easy care. Hand wash cold water, below 30*C with dry flat. Don't twist. Washing machine program: hand wash/wool, cold water 30*C. Thank you for visiting my shop. If you have any questions I'll be happy to answer you. I airmail within 1-2 days after payment . Please allow about 3 weeks for Standard Shipping.